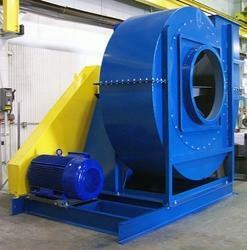 Pioneers in the industry, we offer fan & blower from India. Centrifugal Fans, also known as blower, the equipments that are used to installed in the industries to create vacuum of air and gas streams to the processing plants. They are constructed with Casing; Impellers when rotate produce kinetic energy which in turn to increase the pressure of the air or gas stream. These are also designed to accelerate the air, gradually changing its direction by 90 degree of the airflow. Can operate over a wide range of conditions, these centrifugal fans are available in Forward Curve, Backward Curve or Radial Blades.